I visited Kyoto for the first time in May 2013 and really enjoyed it. The city is filled with beautiful temples, historical sites and beautiful gardens. When my planned trip to China fell through for my long weekend in November, I decided to go back to Kyoto instead. 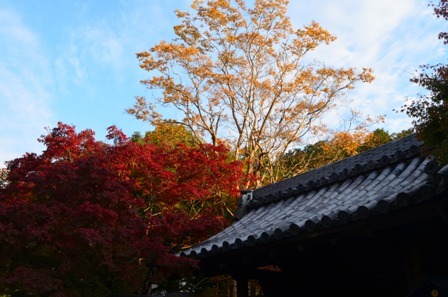 I knew that Kyoto is downright gorgeous in the autumn season when all the deciduous trees turn to blazing colors of red, orange and yellow. 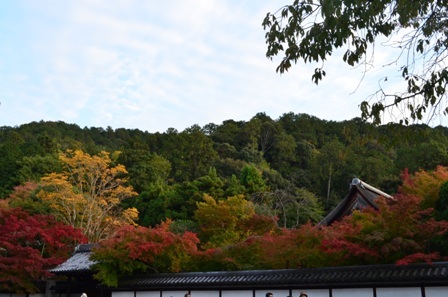 However, what is interesting about Kyoto is that the fall colors come in later than what I am used to in the United States, Europe and even Korea. In those places, the fall colors already hit peak foliage and are in the downward slide to winter bare branches. 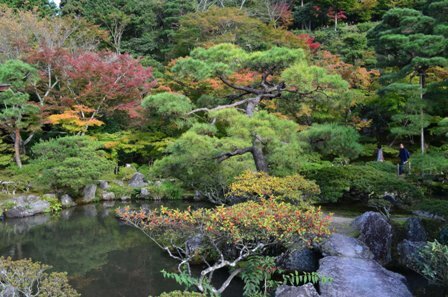 However Japan in general, and Kyoto in particular enter fall later, so peak foliage doesn’t hit until around late November/early December. So I knew that Kyoto autumn colors wouldn’t be in full bloom when I was there, but I was hopeful nonetheless that there would be enough color to get my autumn foliage fix. The search for autumn colors started immediately after I landed in Kyoto. 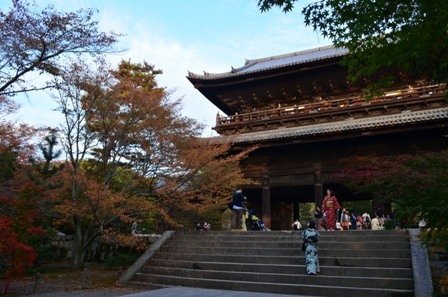 My first stop was the Tofukuji Temple in Kyoto. Tofukuji Temple is a 10 minute walk (clearly marked with signs) from Tofukuji Station on the JR Nara line and the JR Keihan line. 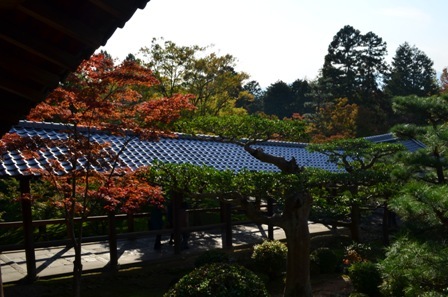 The foliage was starting to turn at Tofukuji, but it hadn’t turned just yet. It was like a tease for autumn lovers. 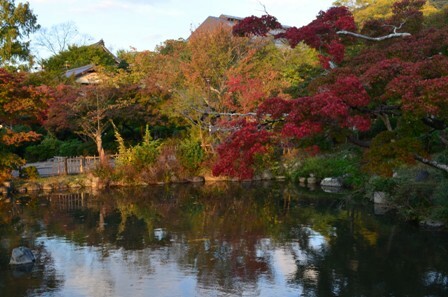 You know what it could look like (particularly if you have seen pictures of Tofukuji in the full thrust of autumn). But as a first stop, it was enough to whet your appetite for more. You just had to know where to look to see incipient autumn foliage around you. Later in the day, I made a stop at Maruyama Park shortly before sunset. 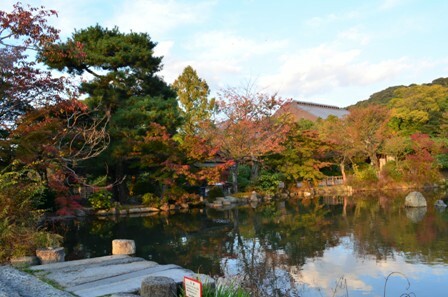 The park is right in the heart of eastern Kyoto and a short walk from Gion and a wide variety of temples, like Shorenin, Eikando, Kodaiji and Kiyomizu Temple. While the park itself wasn’t overwhelmed with autumn color, this particular spot was perfect for a photo op or just sit and contemplate the fall natural beauty. The next day I got an early start for a long day of autumn color and temple hunting. My first stop was the rural town of Ohara. Ohara is easily reached in a couple of ways. The longer way is Kyoto Bus number 17 from Kyoto Station to Ohara (580 yen). Alternatively, and frankly the quicker way, is to take the Karasuma subway line to the terminal station of Kokusaikaikan Station (a roughly 20 minute ride from Kyoto Station, 280 yen). Then transfer to Kyoto Bus 19 (bus station around back; follow the signs). The ride is roughly 20 minutes and costs 380 yen). Once you arrive at the Ohara Bus station, follow the signs (truthfully most of them are in Japanese, but you should see a few English signs) or the crowds for a 10 minute walk up the hill to Sanzenin Temple, the main attraction in Ohara. 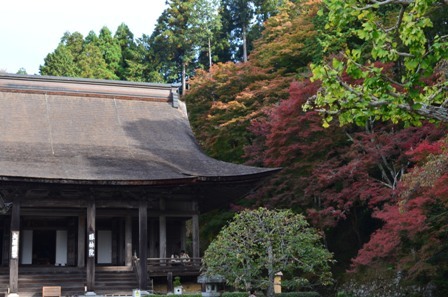 Sanzenin Temple is a temple of the Tendai sect of Japanese Buddhism and was founded in the early ninth century. The temple grounds are pretty sprawling with many gardens, out buildings and walking paths. 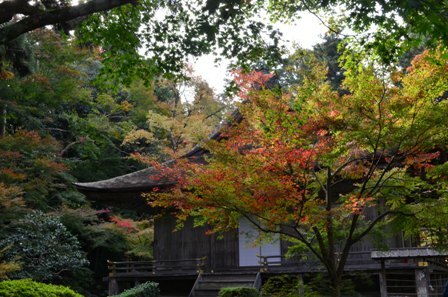 It is a very pleasant outing and you can stroll around the temple grounds and take in the budding autumn colors around you. 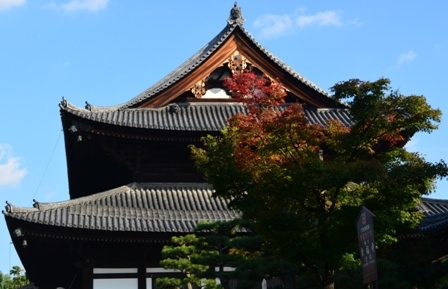 Sanzenin is not the only temple in Ohara, but it is the most prominent and the largest temple. However, there are a couple other temples just a few minutes walk down from Sanzenin. I will say that if you choose to go to Ohara, go early in the morning. I was there shortly after the temple opened at 9am, so the crowds were pretty sparse. However, when I was ready to leave in late morning, I saw the hordes of tour buses and crowds of people milling about. That advice is pretty much true for all popular sites though, particularly at beautiful times of the year, such as cherry blossom season in the spring and the autumn season. The next stop on my full day itinerary was Ginkakuji, the Temple of the Silver Pavilion. Of course I made a bit of a blunder on my return trip. I knew that Kyoto Bus 17 stopped at Ginkakuji on the way from Kyoto Station heading toward Ohara, so I assumed that it would stop at Ginkakuji on the way back. But sorry, tricks are for kids. I realized way too late that I was nowhere near Ginkakuji. As a sidenote, the best bus stop on the return bus ride back to Kyoto is Demachiyanagi Station. According to the map, it looks to be about a 15 minute + walk east to Ginkakuji. But if you are coming from around Kyoto Station, the best buses are 5, 17, 32, 100, 102, 203 or 204. But eventually I did make it Ginkakuji (the title picture for this blog post). 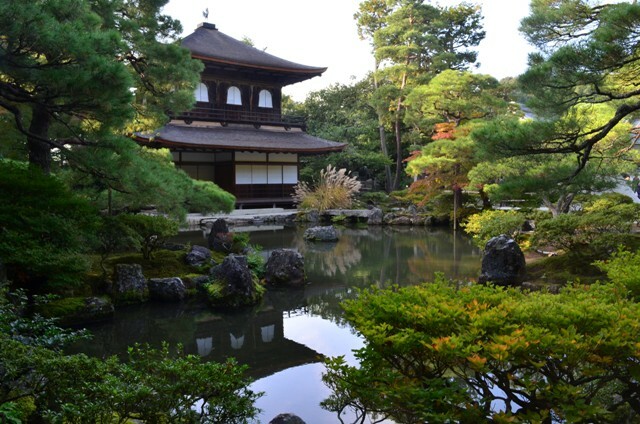 Ginkakuji Temple is located in eastern Kyoto, and was established in 1482 by Shogun Ashikaga Yoshimasa. His original intent was to coat the structure in silver in imitation of Kinkakuji (Temple of the Golden Pavilion), built by his grandfather. But he died before that could happen, so all that remains is the beautiful, simple wood structure. 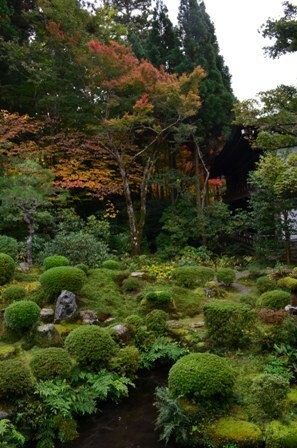 The landscapes of Ginkakuji are very beautiful and very sculpted. The garden pathway is very peaceful (ignore the crowds) and particularly lovely this time of the year. 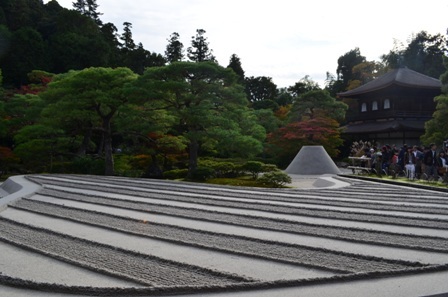 One of the gardens has landscaped rippled sand, with the centerpiece a small sandhill sculpted into the shape of Mount Fuji. I capped off the day with a visit to Nanzenji Temple as sunset approached. 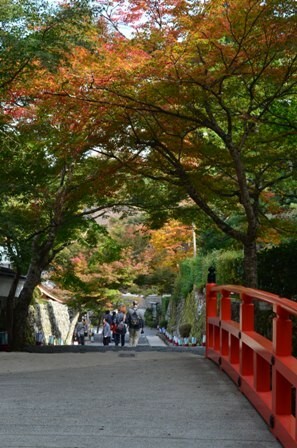 There is about a one mile walk from Ginkakuji, connected by a pretty pathway called the Philosopher’s Pathway, which is lined with cherry trees. 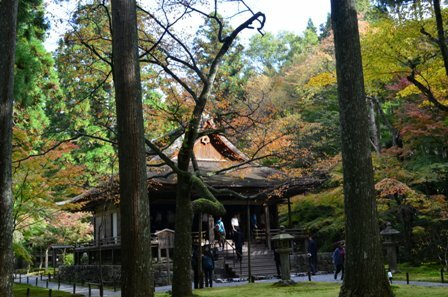 Nanzenji Temple is a Rinzai Zen temple founded in 1293. The temple complex is set amid a beautiful grove of trees. During the fall season, Nanzenji Temple is one of the Kyoto temples open for night illuminations during the height of the fall season. Sadly for me, the temple wasn’t open at night until mid November after I left Kyoto, so I could only enjoy it during the day. That pretty much capped off the first two days of searching for autumn colors. 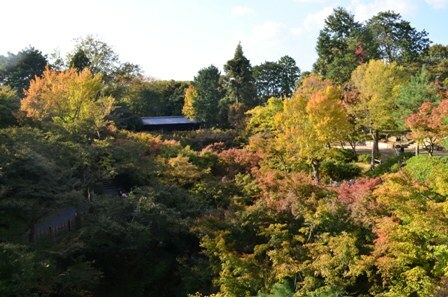 I had two more days of Kyoto fall foliage (addressed in the coming blog posts). 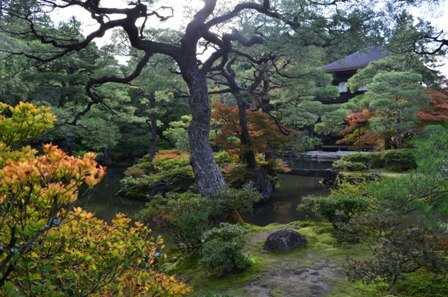 There is plenty to see and do in Kyoto. This was my second long weekend in Kyoto, and I didn’t see the same places twice. 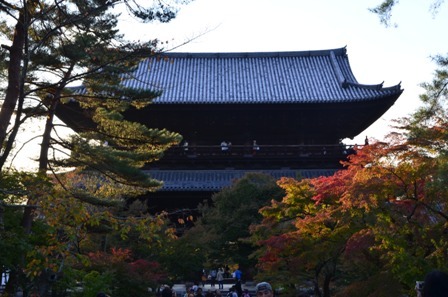 So if you love autumn beauty, I highly recommend Kyoto. Though if you want to see it at peak fall foliage, definitely plan your trip for late November/early December.